This hairpiece, made of 100% Human Hair, is easy to apply without damaging the natural hair. The transparent strand rests on the head, not on the hair and holds the hairpiece perfectly in place without the risk of slipping out. The Hair Dress contains multiple wefts, including one patented Soft Blend Edge for perfect integration. The Hair Dress Ombre colors can be worn on both sides, a sunrise side with a lighter shade and a sunset side with a slightly darker shade. Easy, undetectable Fill-In Strand application. Hair additions with ring, bond, tape or clip application can cause damage to the natural hair. The Hair Dress offers a risk-free application that allows you to add instant volume and length without damaging the natural hair. The Hair Dress stays perfectly in place due to the Fill-In Strand. Because the strand is placed between the top- and base part of the hair, there is no risk of slipping out. The curved shape of the patented Soft Blend Edge helps to blend the Hair Dress perfectly with the natural hair and makes it possible to place the extension extra close to the scalp. 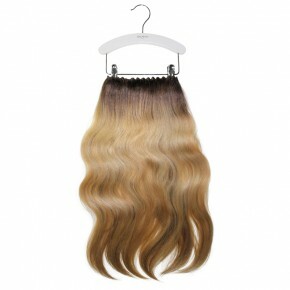 The Hair Dress Human Hair 55 cm is available in 9 ombré colors and 2 level colors. As the natural hair color adapts to every season, it becomes lighter in the summer and darker during the winter, the Hair Dress ombré colors are developed with a “Sunrise” and “Sunset” side. The Sunrise side is layered with a lighter shade and the Sunset side has a darker shade. If you consider to color the Hair Dress, we highly recommend to use level colors (L10, L6) instead of ombré colors. Read more about coloring Balmain hair extensions. Balmain Hair Couture offers a unique 6 months quality guarantee on all 100% Human Hair extensions when using the Balmain Professional Aftercare range. The Hair Dress is perfect for volume and lengthening services. Suitable for all hair types, but due to the risk-free application ideal for damaged hair. Combine the Hair Dress with the Volume Supérieur to create more volume on top. This hairpiece is made of 100% Human Hair. Make a section around the crown area of the head approximately 10 cm from the hairline. Secure the section with a clip on top of the head. Lay the transparent strand onto the section. Release the section. Comb the natural hair over the transparent strand for invisible integration. For extra grip, sew the 2 small security clips onto the weft. Apply the Hair Dress as usual. Secure the clips for extra grip.